Today, we sit alone on the only remaining branch of the human family tree. But we are only one character in the story of human evolution. To truly understand who we are, we must look at how we got here and the key physical traits that make us human. The ability of humans to comfortably stand on two feet for extended periods of time marks us out from almost all other animals. This feat has come about over time through a series of anatomical changes to our skeleton, affecting our cranial base, spine, pelvis, femur, knees and feet. These features serve as useful identifiers in the fossil record of likely bipedalism in our ancestors, the earliest evidence of which may come from the six-million-year-old Orrorin tugenensis. But it's not until Homo erectus came on the scene about 1.9 million years ago that we see the long-legged form, similar to our own, that makes us so well suited to running and walking over long distances. Humans are big headed - our brains are around three times larger than would be expected for an animal of our size. The brains of our early hominin relatives (species more closely related to us than to chimpanzees) were not especially large. Australopithecine brains were little bigger than those of other apes, about the size of a grapefruit. It isn't until the emergence of the genus Homo that we begin to see a more significant increase in the size of brains, dominated by a swelling of the cerebral cortex. 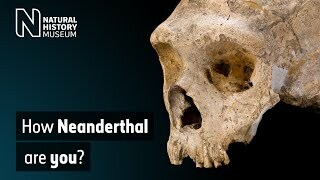 Between 1.8 million and 700,000 years ago the average brain size of Homo erectus doubled, and the brains of Neanderthals and Homo sapiens are even larger. What caused this drastic increase in size is unclear, but it was made possible by changes in diet that allowed humans to extract more energy from their food. The production of tools and fire that allowed pre-processing of plant foods - reducing the work load of jaws, teeth and digestive systems - probably played a part. So did access to meat, a rich source of protein. A larger brain is clearly linked to a number of distinctly human traits: the ability to create more complex tools, more advanced hunting techniques, complex social structures and the advent of language. This 400,000-year-old spear tip made from yew wood was whittled to a point with a stone tool. It would have made a lethal weapon for hunting with. Although not as obvious a human trait as some of the others, a reduction in sexual dimorphism - the difference in size and shape between males and females - is closely linked to one of the most important human features of all: widespread cooperation in a population. High sexual dimorphism in most primates is associated with competition between males for access to females. Most commonly, this leads to males having much larger bodies and canine teeth, which are used in displays of aggression. All known hominins have smaller canines than our closest living relatives, the chimpanzees and bonobos. Among some of our early hominin relatives, such as Australopithecines afarensis, we see quite a large difference in body size between males and females. But species in the genus Homo start to show a level of sexual dimorphism similar to our own. Why is it an important trait for becoming human? Since reduced sexual dimorphism correlates with less aggression between males, it is likely to be associated with greater cooperation within a population and probably made the development of successful societies and civilisations much easier. The existence of a childhood appears to be an important development on the road to becoming human. We define it as the period of time following infancy, when the youngster is weaned but is not able to care for itself. It is essentially an extended period of growth with continued rapid development of the brain. This period allows us to learn the complex set of skills and social intricacies that equip us to exist in complex human societies. Childhood also brings with it another, less obvious benefit for human populations. Unlike most primates, we are still relatively helpless once we stop feeding on our mother's milk. A child is therefore still dependent on the care of others. Importantly however, provision of care is not limited to the mother, but could instead come from a grandmother, elder sibling, or another close relative. This frees up the mother's time, enabling her to engage in other activities and also to have another child much sooner than would be possible if she was still nursing. An extended childhood appears to have first developed in the Homo genus. The beginnings of this are found in Homo erectus after about 1.9 million years. Although other animals use tools, our mastery is second to none, and distinctly human. Ultimately, it stems from the development of a precision grip, the result of changes to the anatomy of the hand. One of the key anatomical features that has enabled this is the presence of a little projection of bone called the metacarpal styloid process. This bone allows us to apply greater amounts of pressure to the wrist and palm. Together with changes in the proportion of our digits, it means we can squeeze objects between our thumb and the tips of our fingers. Considerable manual dexterity was needed to carve this harpoon point from reindeer antler. Around 14,000 years old, it was found in Kent's Cavern, Devon. A chimpanzee, by contrast, is unable to touch the tip of its thumb with the tips of all its fingers, and as a result does not have the same manual dexterity. Some of our more distant relatives such as Australopithecus afarensis, including the famous fossil known as Lucy from 3.2 million years ago, also lacked a precision grip. But recent research using CT scanning suggests that Lucy's close cousin, Australopithecus africanus, may have possessed the required anatomy and grip to wield stone tools more than three million years ago. This grip may have become even more refined by the time of Homo erectus 1.8 million years ago. Coupled with an increased intelligence, it has equipped humans with incredible influence over the world around us. 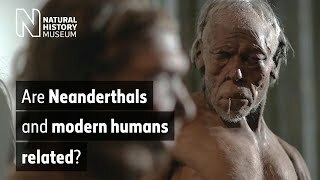 This film shows the making of a Levallois core and flake, an innovative stone tool developed by the Neanderthals and early Homo sapiens. Around 300,000 years ago, they began to shape stone cores from flint that they could carry as a kind of toolkit. They would strike off flakes from this portable core and skilfully turn them into tools for specific purposes such as cutting, scraping, piercing and carving. You can learn more about our origins and evolution in the Museum's new Human Evolution gallery and this feature about the origin of our species.